Your goal, as a pet parent, is to ensure that you are offering your four-legged family member the best care possible. You offer him a tasty dog treat for positive reinforcement, fit him with a comfortable dog harness for those daily walks, provide him with plenty of interactive dog toys to keep him entertained, and make sure that he has the coziest, most supportive dog bed so he can get a restful sleep. In other words, you go above and beyond to make sure that he is as contented as possible. But of all the things that you do for your pet, ensuring that he is healthy is, without a doubt, the most important. After all, you want him to live a long and happy life. It can be really disheartening to learn that your pet is suffering from health problems. Of course, if your furry pal does have health issues, you want to remedy the problem as quickly as possible. Allergies are a common problem that many canines are afflicted with, and oftentimes, those allergies are directly related to food. Fortunately, correcting the problem can be as simple as switching the dog food that he is currently eating to a dog food for allergies. Given the fact that many canines do suffer from food allergies, a lot of dog food brands create limited ingredient recipes that aim to reduce allergens and ease the side effects that are associated with food allergies. But, with so many choices on the market, it can be hard to decide what the best dog food for allergies is. To help you choose the bead dog food for dogs with allergies, we’ve enlisted the help of veterinarians and animal nutritionists. Our panel of experts has analyzed the ingredients in several hypoallergenic dog food formulas to determine their efficacy. Based on our findings, we’ve selected what we consider to be the top five limited ingredient dog food options. Now that you’ve had a look at our top five picks for the best allergy dog food, let’s investigate each option a little bit closer. Below, we offer a detailed review of each dog food for allergies, including the ingredients they contain, what we like about them, and what pet owners who feed these foods to their dogs have to say. After you read through the reviews and decide which formula will best meet the needs of your canine companion, click on the buttons to find the best prices currently listed on Chewy and Amazon. Typically, sensitive skin and tummy troubles are the manifestations of food allergies in dogs. If your pooch has allergies and is experiencing both stomach and skin problems, Purina Pro Plan Focus Sensitive Skin and Stomach Dry Dog Food is a great choice. 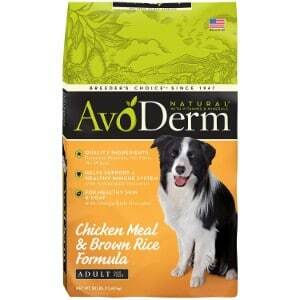 This dry dog food contains limited ingredients to reduce food allergens and ease sensitive skin and stomachs. Corn, wheat, and soy are some of the most common ingredients that canines are allergic to; not only can they cause skin problems, but they are also difficult to digest and can lead to digestive issues. Since this formula contains absolutely no corn, wheat, or soy and instead features natural carbohydrates that are easy to digest, like barley and ground rice, it’s considered a dog food for sensitive stomachs. Real salmon is the primary source of protein in this formula. Salmon is rich in amino acids and helps to build strong muscles, but since it has lower amount of salmon than other types of dog food that also feature this ingredient, it’s considered a low protein dog food. The fact that it contains salmon instead of chicken, which is another known allergen for dogs, further enhances the effectiveness of this formula for combating allergies. It’s also infused with essential vitamins and minerals, like Vitamin K, vitamin B, zinc, potassium, and copper, to offer well-balanced nutrition. And since it contains glucosamine, it further supports joint health and can help to prevent joint issues in dogs that are predisposed to these problems, like Great Danes, Dachshunds, Boxers, and Mastiffs. Final Verdict: Purina dog food is one of the most trusted brands on the market. 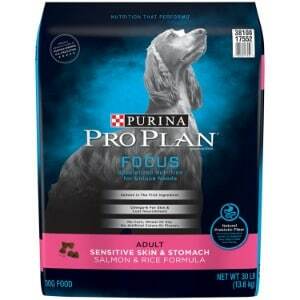 Their Pro Plan Focus Sensitive Skin and Stomach Adult Dry Dog Food formula offers premium ingredients and is formulated to reduce allergies and ease sensitive skin and tummies. If your furry pal is suffering from skin issues as a result of food allergens, PS for Dogs 100% Hypoallergenic Dog Food just might be the solution that you – and your pooch – are looking for! This formula has a low glycemic index, which helps to reduce yeast growth on the skin that can lead to redness, bumps, irritations, itching, and foul smells. This formula contains absolutely no corn, wheat, or soy, which many dogs are allergic toy, making it a grain free dog food. 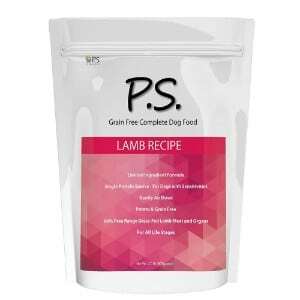 It’s also packed with protein, as it features human-grade New Zealand lamb as one of the first ingredients, so you can rest assured that your pet will be getting a premium quality protein that he needs to develop healthy muscles and maintain the health of his skin and coat. This formula is also packed with other wholesome ingredients and infused with essential vitamins and minerals to ensure your canine companion is receiving the very best nutrition possible while reducing his allergies. Since the kibble is air-dried, the morsels are meaty, tender, easy to chew, and very palatable. In fact, most pet owners who have used this product say that their dogs’ love the taste! Made in the USA and backed by a satisfaction guarantee, you can rest assured that your pet will be eating the best food when you feed him PS for Dogs 100% Hypoallergenic Dog Food. Final Verdict: For a high quality dog food for allergies, PS for Dogs 100% Hypoallergenic Dog Food is a great choice. This food is specially formulated to reduce skin irritations and other side effects of allergies, and most pet owners say that their dogs love the flavor. However, do note that the bag is on the smaller side, so keep this in mind when ordering. If you’re looking for a natural dog food to reduce allergies in your adult West Highland White Terrier, Pug, Poodle, or any other adult breed, AvoDerm Natural Dog Food for Adults is an excellent option to consider. Made with all natural ingredients that are easy to digest and nourish the skin, you can rest assured that your pooch will get the nutrition that he needs while reducing the side effects of the allergies he is suffering from. What sets this formula apart from others is that it contains avocados. While avocados are technically a fruit, they are a fantastic source of protein and they are easy to digest. They’re also packed with other essential nutrients, including fiber, vitamins A, C, E, B6, and essential fatty acids. In other words, they promote the development of lean muscle mass and help to nourish the skin and coat; plus, dogs love the flavor. Other premium ingredients include grown brown rice and oatmeal, which are easy to digest carbohydrates, tomato, and pineapple. This formula is also infused with a wealth of essential nutrients to ensure your pup is receiving well-balanced nutrition. Overall, pet owners report that they are very pleased with the product and that their pets love the flavor. Final Verdict: AvoDerm Natural Dog Food for Adults is specially formulated to reduce allergies in adult dogs of all breeds and sizes. It feature real avocados, which is an unusual, yet healthy ingredient found in dog food, and most pet owners say that they have seen a positive outcome after feeding their dogs’ this food. Many pet owners trust Wellness dog food, as it contains the best possible ingredients to offer complete nutrition for their dogs. Their Simple Natural Limited Ingredient Dry Dog Food is specifically formulated to reduce allergies, as it is a limited ingredient recipe. In other words, it contains fewer ingredients for canines that have food sensitivities, allergies, or intolerances. This formula features a single source of protein, which is derived from real salmon, helps to reduce allergies while offering essential nutrients, like amino acids, Omega 3 and 6 fatty acids, and protein. Easy to digest carbohydrates, like potatoes, will keep your pet energized and ease any stomach issues that he may be having. It’s also infused with probiotics and prebiotics to further improve digestive health and ease tummy troubles. The addition of flaxseed helps to nourish the skin and coat, and the infusion of essential vitamins and minerals ensure that your pup receives optimal nutrition. 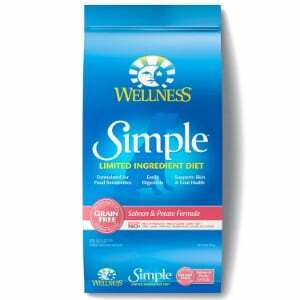 Final Verdict: If your dog is suffering from food allergies, Wellness Simple Natural Limited Ingredient Dry Dog Food is specifically made to help reduce allergic reactions that are associated with certain foods. It contains all natural ingredients and most pet parents say that they found that it offers positive results. 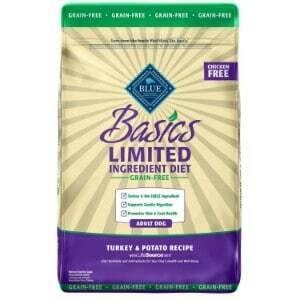 The last hypoallergenic dog food on our list comes from Blue Buffalo. Blue Buffalo dog food is highly regarded for their use of all natural, nutrient dense recipes that are specifically formulated to meet the unique nutritional needs of all pets. Their Basics Limited Ingredient Diet Natural Adult Dry Dog Food offers only the simplest ingredients to reduce allergic reactions in dogs. Like all Blue Buffalo formulas, the first ingredient is real protein, which, in this formula, is sourced from deboned turkey. Turkey is an excellent source of protein, as it is easy to digest and contains the vital nutrients that canines need to build lean muscle mass and support healthy joints. Other ingredients include natural, easy to digest carbohydrates, like peas, potatoes, and pumpkin, to give your adult pup the energy he needs. It’s also free of chicken, beef, corn, wheat, soy, eggs, and dairy, which are allergens for many dogs. It’s easy to digest, so it can help to settle stomach woes, and it will also nourish your furry pal’s skin and coat. This dry dog food from Blue Buffalo is also infused with Life Source Bits, an ingredient that is exclusive to Blue Buffalo products. These bits are made by animal nutritionists and veterinarians and contain a precise blend of antioxidants, vitamins, and minerals that dogs need to thrive. Final Verdict: For adult dogs that suffer from food allergies, Blue Buffalo Basics Limited Ingredient Diet Grain Free Natural Adult Dry Dog Food is a fantastic choice. This limited ingredient recipe features premium quality ingredients and no foods that dogs are known to be allergic to. If you think that your four legged family member is suffering from food allergies, filling his dog bowl with food that is specifically formulated to reduce allergies can significantly improve his health and reduce his sensitivities. But, before you switch out the formula that’s in your dog food container, you want to make sure that you choose a high quality food option that will actually offer positive results. As we mentioned, a lot of manufacturers are now making limited ingredient and/or hypoallergenic recipes that are intended to reduce allergies. While there are a lot of dog foods for allergies to choose from, not all of them are created equal. Just because a label says that it’s hypoallergenic doesn’t meant that it really is. Before you decide to switch your pet’s food to a hypoallergenic formula, make sure you do your due diligence. After all, his health and well being is your top priority, and the food he eats plays a huge role in his overall health and happiness. In this portion of our guide, we answer some questions you might have about allergen free dog food so that you can make a well-informed decision for the furriest member of your family. If your pooch is exhibiting any of these symptoms, there’s a good chance that food allergies are to blame. However, do make sure that you have your vet conduct a comprehensive physical examination to determine if, in fact, food allergies are to blame. These symptoms can also be associated with other health issues, so you want to make sure that the cause is accurately diagnosed to ensure your pet is receiving the right treatment. Of course, artificial ingredients can also cause adverse reactions and aggravate allergies. If your pup is exhibiting any of the aforementioned signs of food allergies and it has been determined that he is, in fact, sensitive to certain foods, switching his diet to a premium quality dog food that is specifically formulated for dogs with allergies can help relieve his allergies and improve his comfort and health. Limited ingredients. Dog food recipes that are made with limited ingredients are the best for food allergies. Since they are only derived of a handful of select ingredients, there’s less of a chance that your pet will experience a reaction. Why? – Because it’s easier to keep tabs on what your pet is eating. Grain free. The best dog food recipes for allergies are free of grains like soy, wheat, and corn. These are known allergens in dogs, and they are also difficult to digest, further compounding the symptoms that are associated with allergies. Premium protein. Make sure that the label clearly indicated what type of protein the food is made of; and, ensure that the protein source isn’t one that it is believed your pet is allergic to. For instance, if your vet thinks your dog is allergic to beef, look for a beef-free formula. No additives. Artificial colors, flavors, preservatives, and fillers are unhealthy for dogs that don’t suffer from allergies, so imagine what they will do to dogs that do have sensitivities? Steer clear of foods that contain additives to avoid serious side effects. Learning that your pet has food allergies is upsetting, to say the least. However, feeding him the best hypoallergenic dog food can help to alleviate the symptoms that he is experiencing and improve his overall health and well being. All of the recipes featured in our review are made from premium ingredients and are specifically formulated for canines that suffer from food sensitivities.